It's a day of firsts for me! For the first time, I used my iPad mini to read an ebook. I'm also trying a feature I've never participated in before, called Kid Konnection. 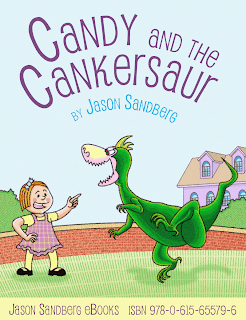 Published in 2012, Candy and the Cankersaur is an ebook for children by Jason Sandberg. 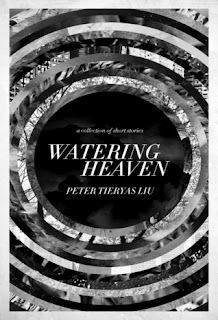 I don't usually read ebooks, but when the author invited me to take a look at his book, I decided to read it because the book is not currently available in print form. Although money cannot buy happiness, it can buy you a sensational pet. A young, well-to-do girl named Candy gets a pet dinosaur from her father, Mister Wellington, who only wants to make his daughter happy. When the Cankersaurus Rex arrives at the Wellington mansion by helicopter from the Island that Time Forgot, Candy is thrilled. She names her new pet Cank, and attempts to teach him not to bite. Chucky, Candy's best friend and neighbor, becomes jealous and asks his (rather matronly-looking) mother if he can also have a dinosaur as a pet. She tells him in no uncertain terms that he cannot--dinosaurs are extinct, after all. Crestfallen, Chucky decides to take matters into his own hands. Wearing his signature sailor suit, Chucky kidnaps Cank, and eventually leaves him at a circus. This book is adorable! 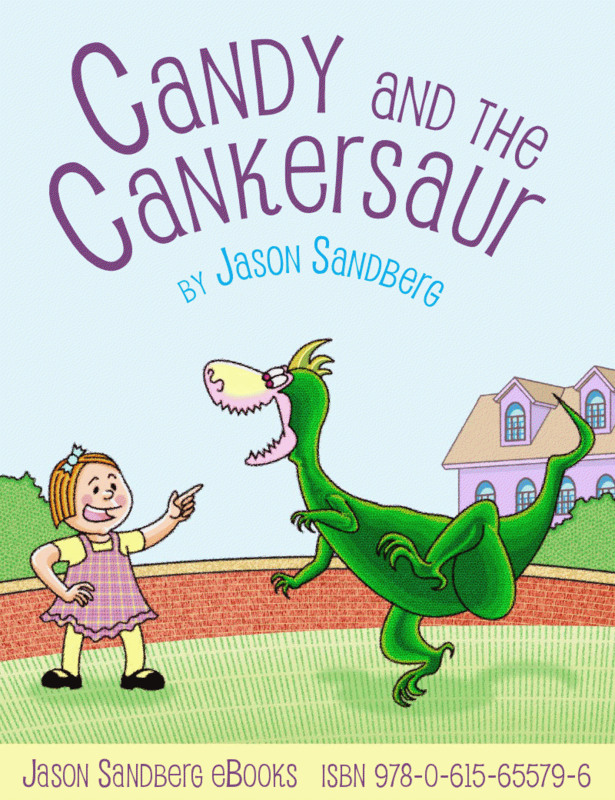 Candy and the Cankersaur seems to be the right length for young children, 28 pages, with a few lines of text on each page. There's some drama and tension in the story, enough to capture and hold the interest of children. The author thinks that this picture book would work well as a bedtime story for children ages 3-6, and as a read-alone book for children ages 6-9. The drawings are fabulous! I loved how this book looked on my iPad mini. 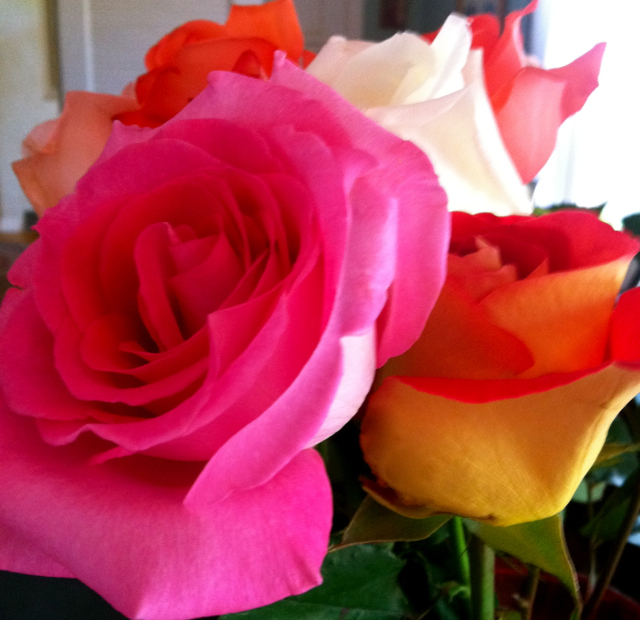 While I was reading it I marveled over how wonderful the pictures looked. The pages fit beautifully on the screen. The colors of the cartoons are pleasing and the illustrations have the perfect amount of detail, neither too much nor too little. After I read this book, I wished that my young nephews lived closer so that I could share the book with them on my iPad mini (maybe I'm not completely old-school if I can picture reading to them in this way). I'm sure this book would stimulate the imaginations of young children. As a child I loved looking at picture books, and I still remember the impact they had on me. I wanted to stare at the pictures for as long as possible, as if that would somehow enable me to enter the world on the pages. This book would have a similar effect on children, I think. It's simply charming. 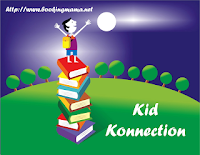 Kid Connection is a fun feature hosted by Booking Mama each Saturday. If you'd like to participate in Kid Konnection and share a post related to children's books (picture, middle grade, or young adult), please stop by Booking Mama and add your post to the Mister Linky. 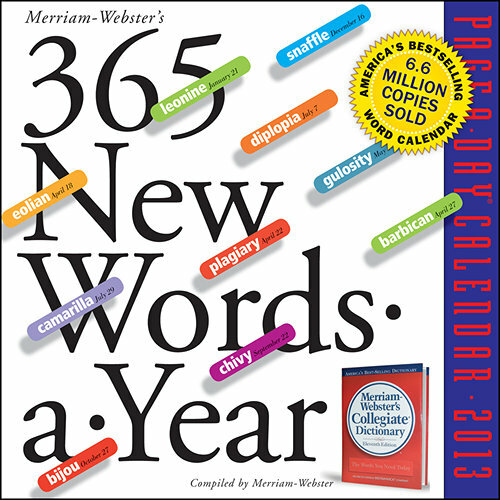 It was tough to start the new year without my daily fix of new words! 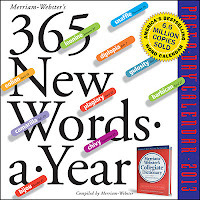 I was happy to receive the new 365 New Words-a-Year calendar that I'd ordered from Amazon. I can always rely on finding a few good words from the calendar to feature in Wondrous Words Wednesday. Below (alow?) are three words from the beginning of my 2013 calendar. Jay went alow to see if he could find more drinks for the hard-working crew. A nautical term, "alow" means "in or to a lower part of the vessel", indicating the deck or the area of the rigging closest to the deck. The opposite of "alow" is the more frequently used word, "aloft", used to refer to a higher part of the ship. "Someone's turned the chest out alow and aloft." The expression "alow and aloft" refers to the upper and lower parts of a ship, but can also be used in a more general sense to mean completely or thoroughly. The art history student was required to write an ekphrasis on Picasso's painting Guernica, which depicts the tragedies of war and the tremendous suffering it causes. 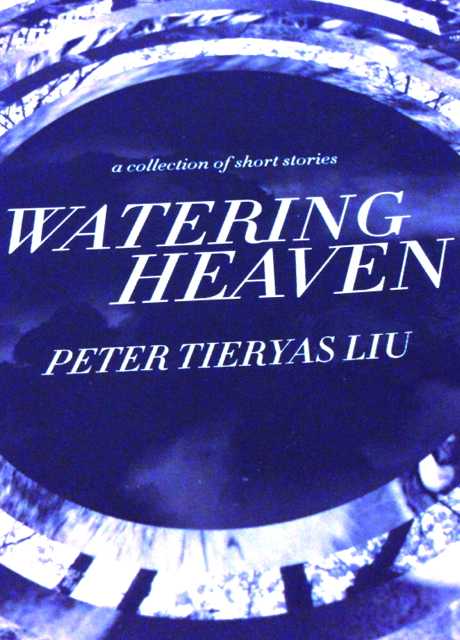 I encountered a variation of this word before, when I read and reviewed an arresting collection of flash fiction inspired by various works of art, We Bury the Landscape by Kristine Ong Muslim. 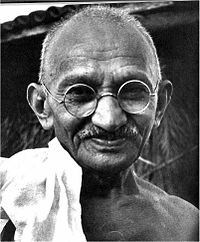 I featured the word here in order to employ this term, and to make it more permanent in my memory. 3. WYSIWYG: a display generated by word-processing or desktop publishing software that exactly reflects the appearance of the printed document; acronym for "what you see is what you get"
We made the pamphlet using a simple WYSIWYG program. Originally used by advertisers to indicate that a deal was honest and straightforward, today computer users use this term to describe software that accurately reflects the appearance of the finished product. This is obviously very helpful. Sometimes I wish previews of my blog posts were more identical to the actual posts, especially in regards to spacing issues. 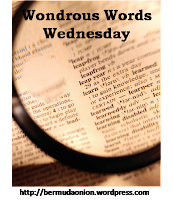 Hosted by Kathy from BermudaOnion's Weblog, Wondrous Words Wednesday is one of my favorite memes. What new words have you discovered recently? Lines from a well-known nursery rhyme were stuck in my head. 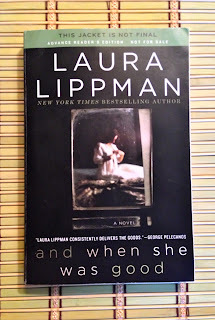 Last week, a book I won from Peppermint Ph.D. appeared in my mailbox, And When She Was Good by Laura Lippman, and so I kept hearing the lines in my head. I Googled the rhyme for the exact words, and learned that it isn't actually a Mother Goose nursery rhyme. The words are from the poem "There Was a Little Girl" by Henry Wadsworth Longfellow, and the line "she was very, very good" should really be "she was very good indeed". I'm eager to find out why the book has this title. Mailbox Monday is a social meme that encourages us to share our new books. Created by Marcia, who has set up various book blogs as well as a Mailbox Monday blog, it's been a "traveling" meme for the past few years. I truly enjoyed hosting Mailbox Monday during December, but now it's time to pass the torch. 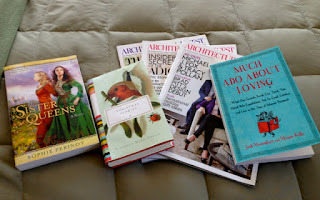 Lori's Reading Corner is the host of Mailbox Monday for the month of January. 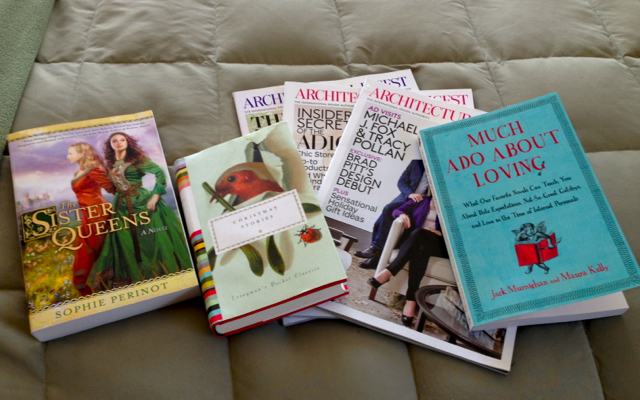 What books landed in your mailbox recently?